India opener Shikhar Dhawan returned to form with a blazing, unbeaten 97 as Delhi pulled off a seven-wicket upset over Kolkata at Eden Gardens on Friday. 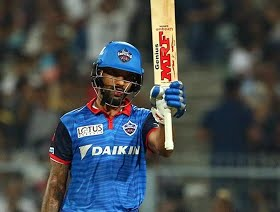 Dhawan missed out on a hundred as, on 96, he took a single instead of going for a big shot, after which Colin Ingram blasted Piyush Chawla for a six to complete the victory for Delhi. At the post-match presentation, Dhawan admitted that he knew it would be his maiden ton but decided to play it safe as he wanted to take the team home. “I knew it could be my first T20 hundred but the team goal is more important, hence I took that single rather than taking a huge risk. It's totally opposite here compared to Delhi. “I really enjoyed in the first six overs but I knew I had to stay till the last. I was getting the right thoughts and I had to take the game deeply," Dhawan further said. He also praised Rishabh Pant's big-hitting abilities.."Pant is such a big hitter he can always hit it out of the park,” Dhawan stated. The win takes Delhi to fourth place in the points table, with four wins from eight matches. Kolkata, Mumbai, Punjab also have the same number of points.